My friend Nancy made this FABULOUS pasta for the party. I can’t even describe how fan-freakin-tastic it is. I ate the leftovers for breakfast and dinner on Sunday, and we all ate it for dinner last night. There is one serving left. It is mine. Melt about one-half stick of butter slowly over less than medium heat in a medium to large-sized skillet. Slice garlic very thin (think Ray Liotta in Goodfellas) and chop onion and then place both in skillet. Start slicing mushrooms (this is important—do not wash the mushrooms—I learned this from my friend Cathy Chou). Once garlic is browned and onion is softened begin adding sliced mushrooms to mixture. At this point, you may need to add some more butter to keep mushrooms moist. Add a pinch of salt as mushrooms cook (this opens their flavor), add about a teaspoon of Herbs d’Provence (HP) and a 1/2 teaspoon of parsley. As mushrooms cook, add more. You may need to add more butter, but definitely drizzle more salt on the new cooking mushrooms, some more HP and parsley. Begin chopping spinach—wash thoroughly in a colander. Once mushrooms are cooked through, add about a quarter-cup of Parmesan cheese. Add it slowly so the juice from the mushroom/garlic/onion mixture can absorb it and you don’t add too much! You don’t want the mixture to be thick, but slightly loose and free. Remove the mushroom mixture from the skillet and place in a bowl. Add about two teaspoons of olive oil and then begin adding spinach. Once spinach is cooked through, add the mushroom mixture back into the skillet and then add a titch more butter and a splash or two of white wine. While this is simmering, boil water for macaronis. When water begins to boil, add olive oil (instead of salt—the mushroom/spinach mixture is salty enough) and then add the linguine. Cook for 11 minutes—al dente!!! 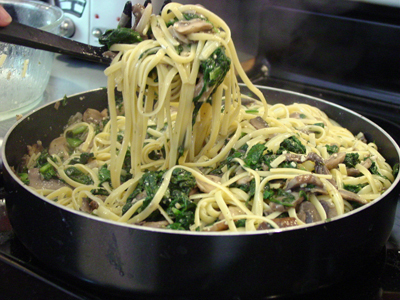 Then drain the linguine and place in the skillet with the mushroom/spinach mixture. Place in bowl and serve with Parmesan cheese on the side and a good crusty Italian bread with butter. Serves about 8 (or ten–12 if this is a first course and there will be an entrée).